Although I can’t claim to know the city inside out like a native Londoner, I’ve been here often, and wandered around places that many visitors have yet to see and many Londoners take for granted. One of the reasons I like wandering around London so much is because it’s so different to where I live. That said, each borough has its own identity too, and I think it’s worth knowing how London developed in order to make sense of it all. Ever since the Roman Emperor Claudius established the port of Londinium in AD 43 the city’s reputation for being England’s powerhouse has never been in doubt. The original Roman city’s boundary is still basically the same today, and there are still remnants of the old Roman Wall – but that’s where the similarity ends. Today, the City of London, also known as the ’Square Mile’, is home to very few people, but home to one of the world’s most important financial centres. London has another city within its boundaries – Westminster. This city within a city has been the nerve centre of Royalty, Religion, and British politics for a thousand years, but it’s also much more than that. The West End is the entertainment district of Westminster with many of the famous theatres situated around Leicester Sq. This area also includes Chinatown and Soho, which used to have a reputation for sleazy nightclubs and strip joints, but not so much these days. On the other hand, Oxford St and Piccadilly, and the area in between, is a shopper’s delight. Apart from the two cities, there are another 31 boroughs in London which have developed over the centuries with their own identities, and there are a fair number that deserve a visit for different reasons. 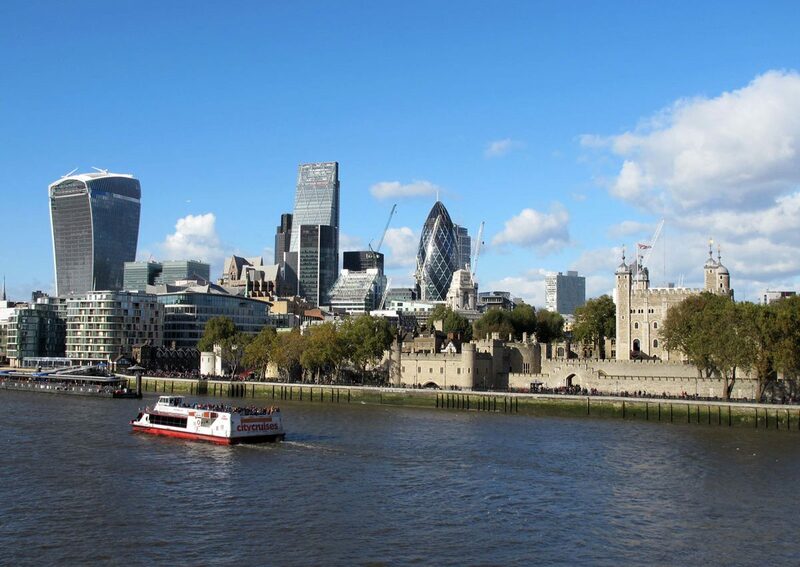 North of the Thames is generally more tourist orientated, but that doesn’t mean that south of the river is uninteresting, as a walk along the South Bank of the Thames will reveal. Both sides of the river east of the centre was the home of London Docks, which in the heyday of the British Empire was the largest docks in the world, but now a place where people live – if they can afford it – in converted warehouses and new ‘apartments’. The East End proper is traditionally the part of London where working class Londoners lived, as many of them worked in the docks. These days however, many of them have moved out to the suburbs such as the dormitory towns of Essex, leaving the ‘East End’ to many immigrants from around the globe. There are over 50 ethnic communities speaking over 300 languages in London which makes it one of the most multicultural cities in the world. The transition from a small Roman crossing of the Thames to today’s vibrant metropolis has taken, like the river itself, many twists and turns along the way – far too many to mention here – but I’m hoping that I can unravel some of London’s important moments in history in order to make sense of what can be a difficult city to get to grips with. It may be difficult, but never boring.